April has brought with it a mix of sunshine and showers, all of which has seen increased growth and more colour to the garden, particularly in contrast to the end of March. Overview from the conservatory. More foliage and flowers. In the Strawberry Border the strawberries have started flowering. 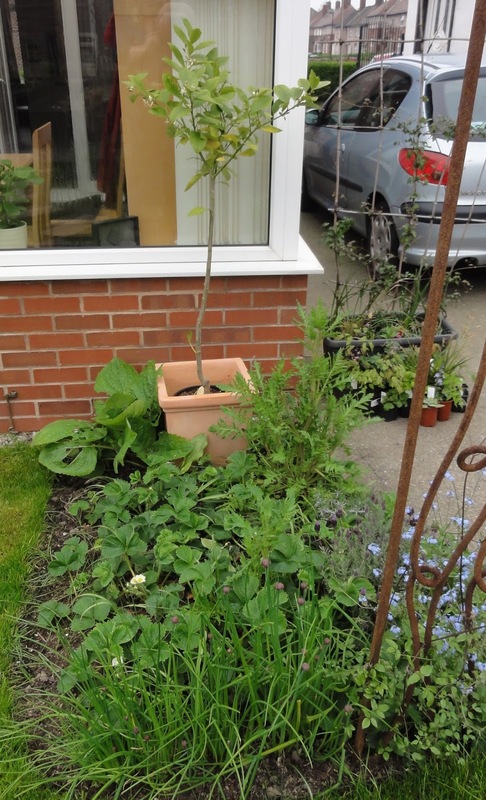 I've decided that the Salvia transsylvanica (left of the lime tree pot) doesn't look right in this border and I need to move it. It also grows quite quickly and covers the strawberries. I've also got some self-sown poppies that are getting a bit too big for their boots, so I will probably pull them out once they have finished flowering. 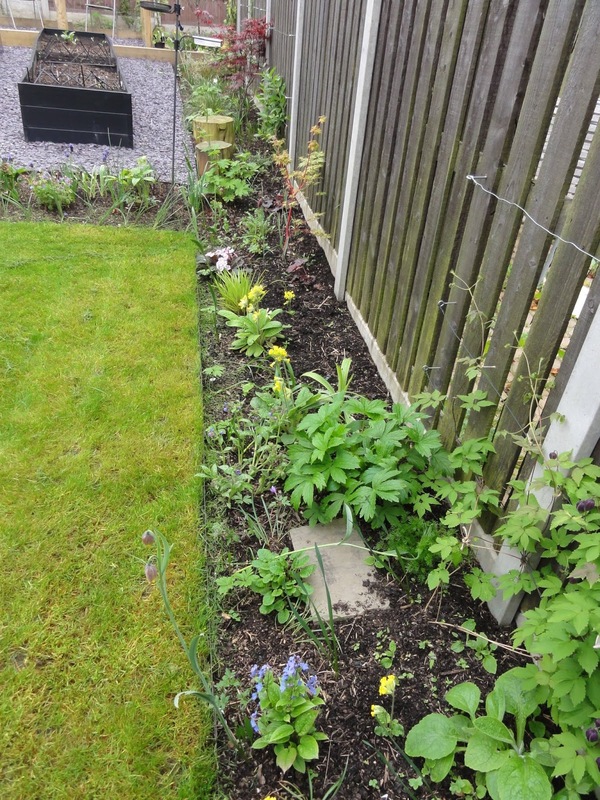 The Herb Border has filled out considerably, though much is hidden by the forget-me-nots. 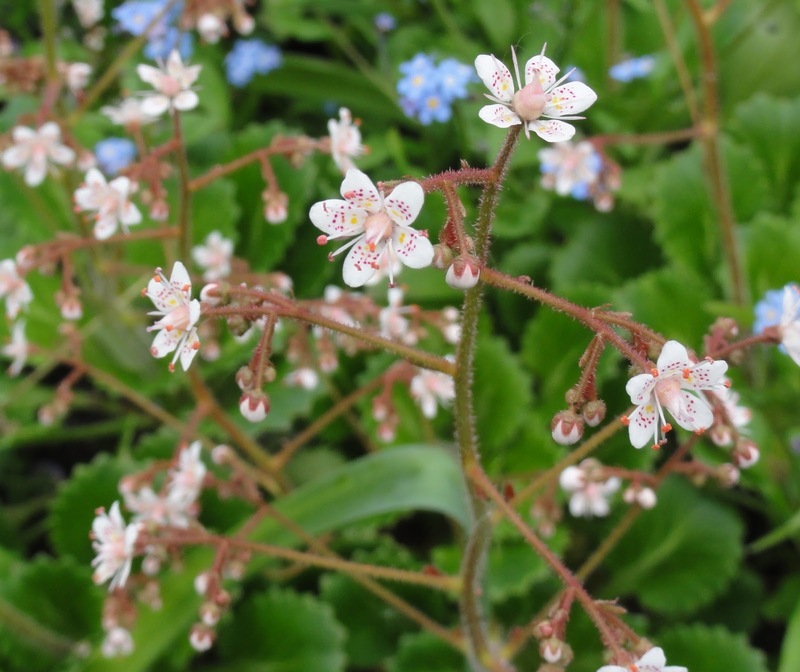 I do love forget-me-nots, but I think some editing is needed! The herbs have grown enough since planting last summer, that I can now rely on them for my cooking. 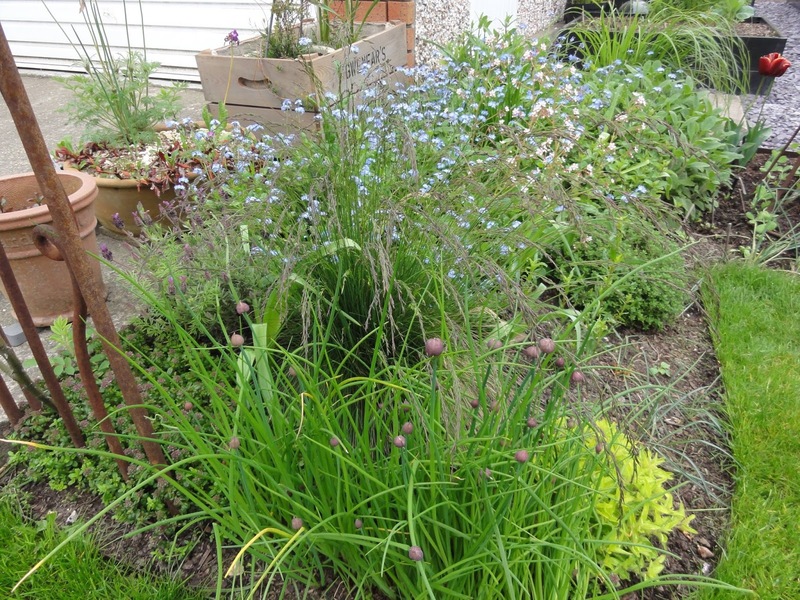 Which is just what you want from a herb border. However, in another part of the Shady Border, I need to move something. I seem to have planted Sarcococca confusa too close to Lamium orvala. I think the Lamium that needs to move, as I like the idea of the evergreen Sarcococca growing up the fence. A task for May. 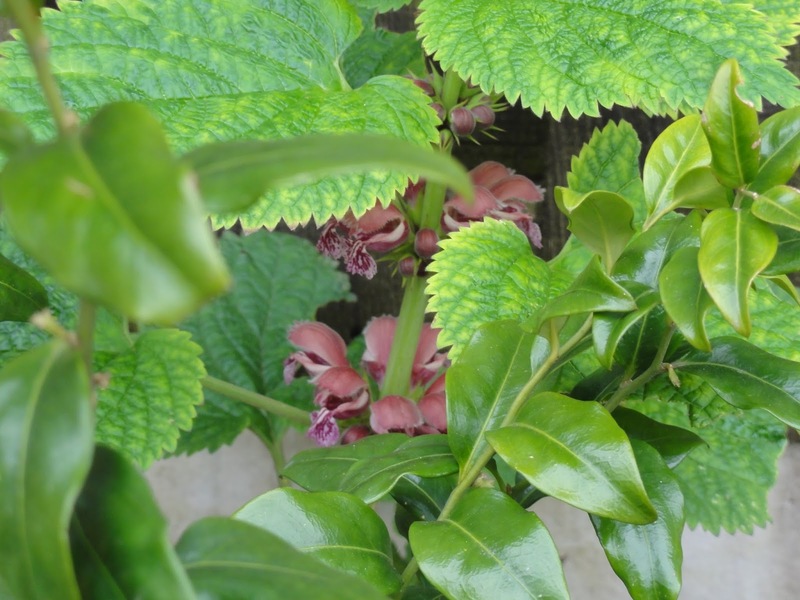 The flowers of Lamium orvala peeking through the Sarcococca. After being pot bound, the Luzula sylvatica 'Marginata' is flowering wonderfully. I love the airy nature of its flowers. 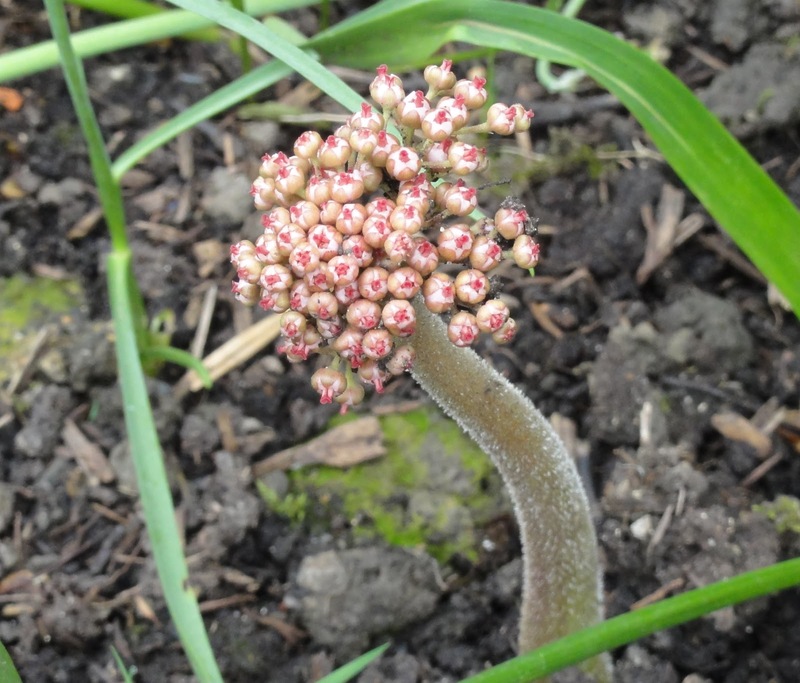 The alien like flower spikes of Darmera peltata (Umbrella plant), which come up before the leaves. but for the many bees that have enjoyed the flowers. so I may have quite a few free shrubs as a result. Saxifraga x urbium flowering in the Herb Border. In the Kitchen Garden, I've started my small section for perennial edibles. 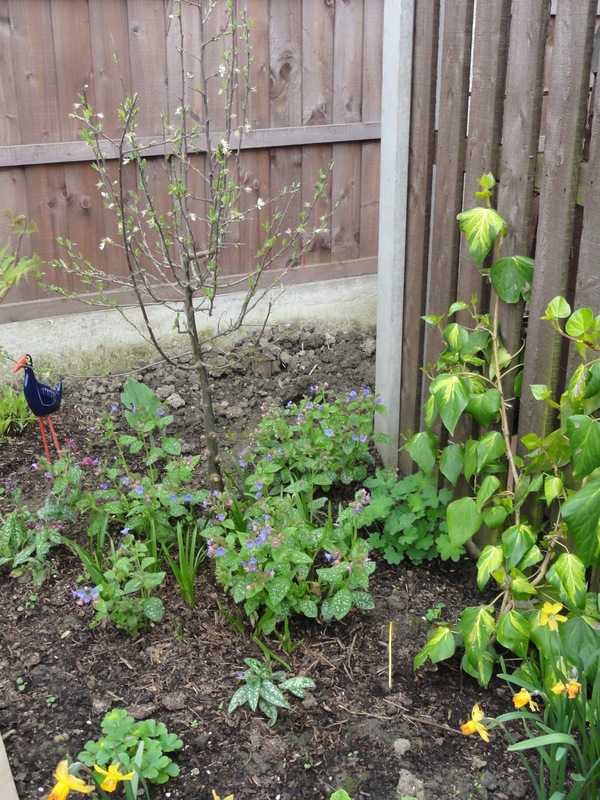 I've planted out perennial Kale Daubenton, and added non-flowering sorrel, which I got from Alison of The Backyard Larder. Alison sells quite a number of edible perennials and I recommend her to you. I also have some wild garlic which I thought I might add to this section. I've planted potatoes, Pink Fir Apple and Stemster, sown chard and beetroot, including Beetroot Cylindra which was recommended by Jono over at Real Men Sow. And there are plenty of brassicas, legumes etc getting bigger by the day in the mini greenhouse. We also finally finished sorting out the space between the pergola and the fence. This isn't technically our land. Long boring story... I've spoken to the neighbour and this fence is very new and it's unlikely they will ever move the fence back, or if they do so, it will not be for years. They don't mind me growing plants in the in-between space. 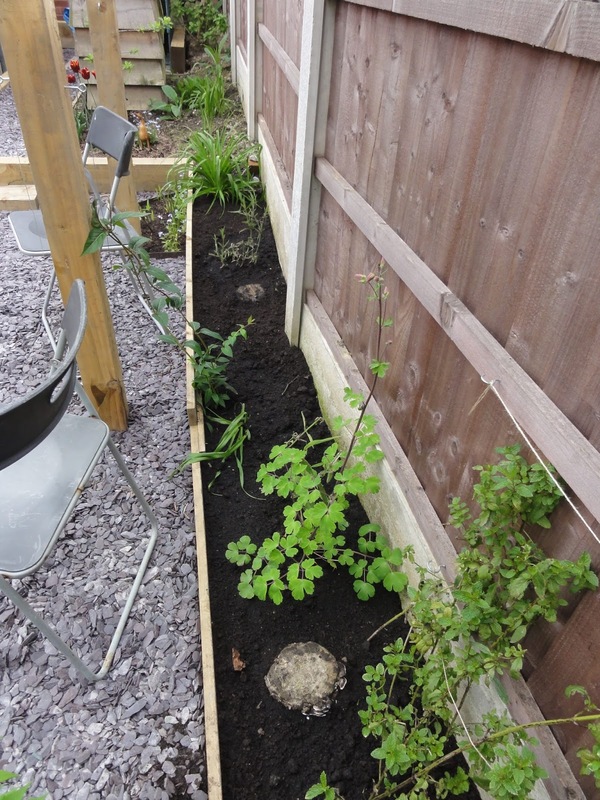 The Back Border, or should I call it the 'Illegal Border - immigrants welcome'?! Legally it is their land and you never know what might happen in the future, so the game plan is that I plant only plants I'm prepared to 'lose'. 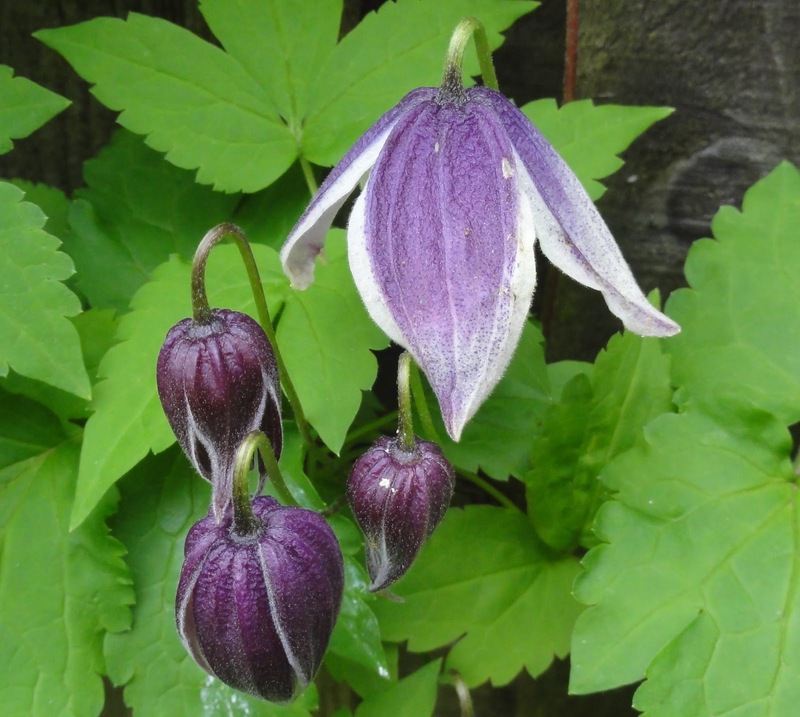 This includes a couple of climbers, Clematis alpina 'Pamela Jackman', which is deciduous, and an evergreen honeysuckle Lonicera similis var. delavayi. 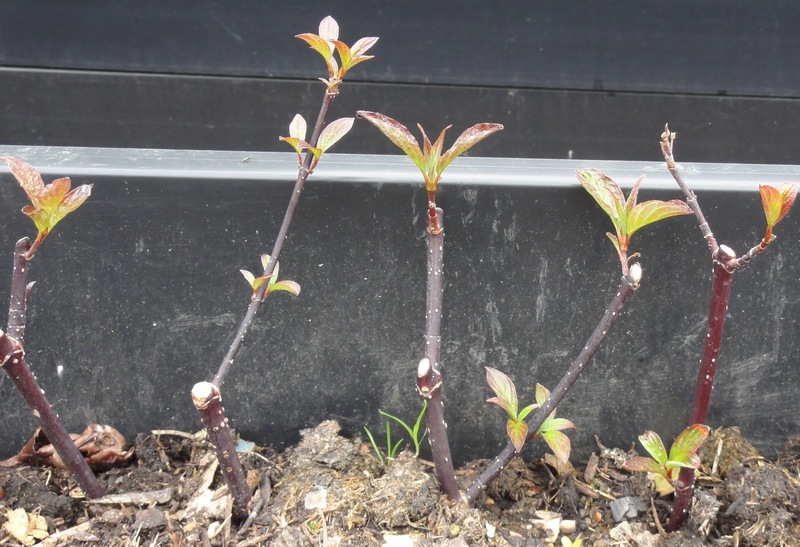 These grow up the pergola and the honeysuckle will add some winter interest with its leaves. I'm also adding some perennials and I'll throw in some wildflower seeds. 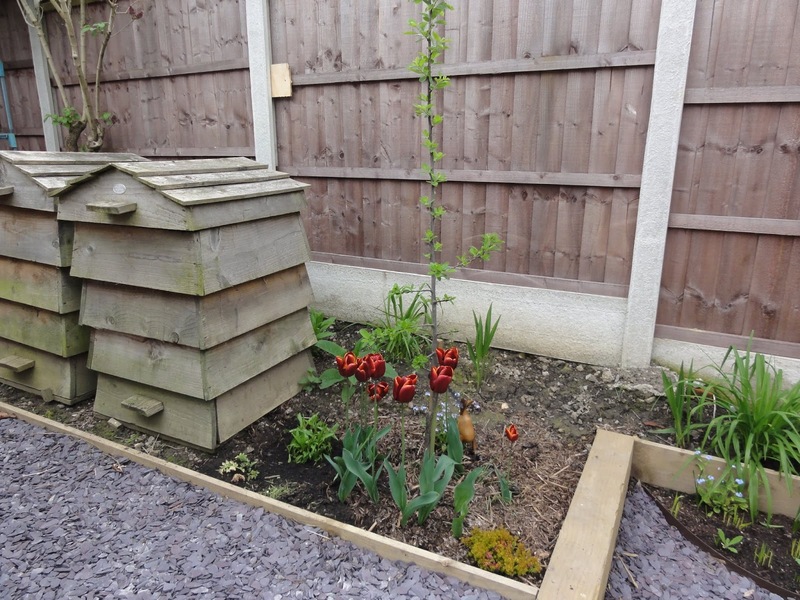 The only plant I don't want to lose is the grapevine, but I have planted this well inside our border. 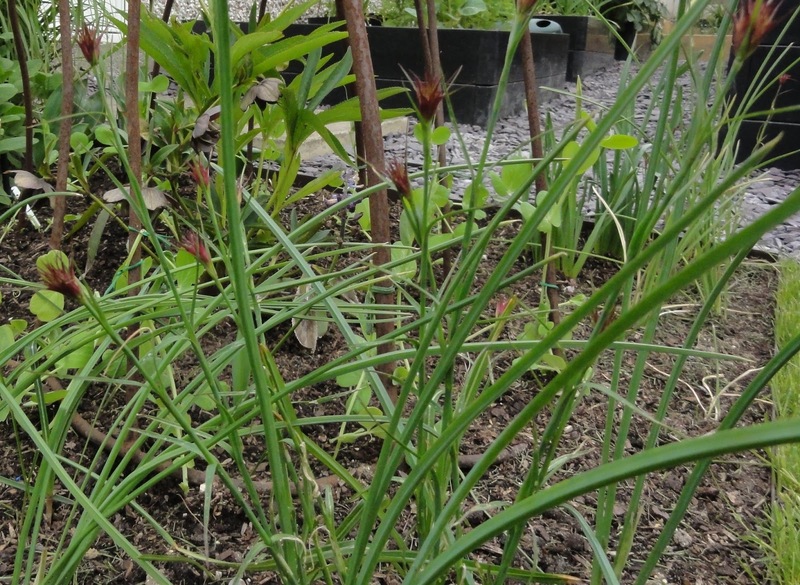 Finally, there is the difficult to photograph, Dianthus cruentus, that are almost ready to flower. These are the infamous dianthus that Cleve West planted in one of his Chelsea Gardens' several years ago that were much admired. I was one of those admirers, and when last summer Sue Beesley tweeted that she had some, so I said yes please and picked them up at her Tatton Park stand last July. 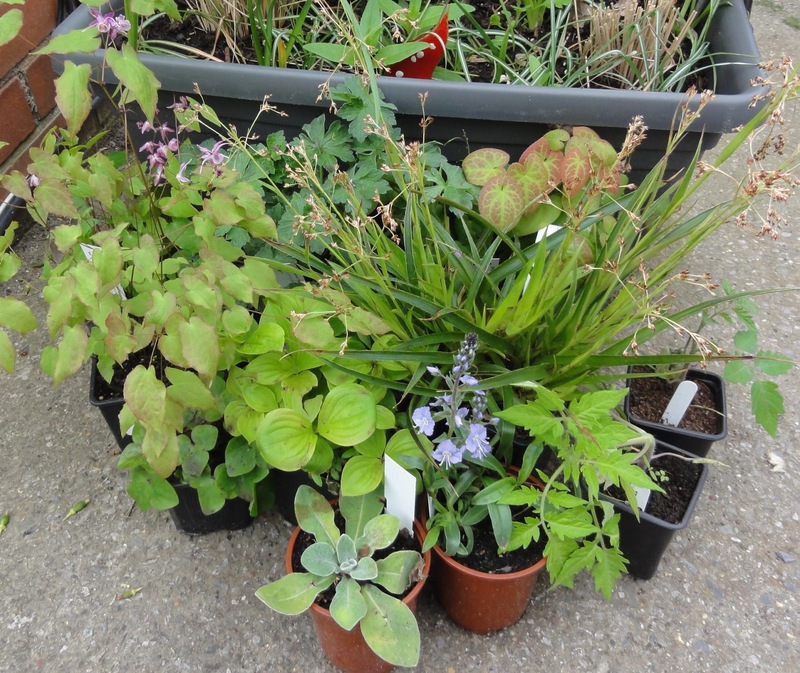 Twitter can be wonderfully useful for sourcing plants! Behind them are the recently planted eating pea 'Lativan' which should climb up the obelisk and be both pretty and edible. 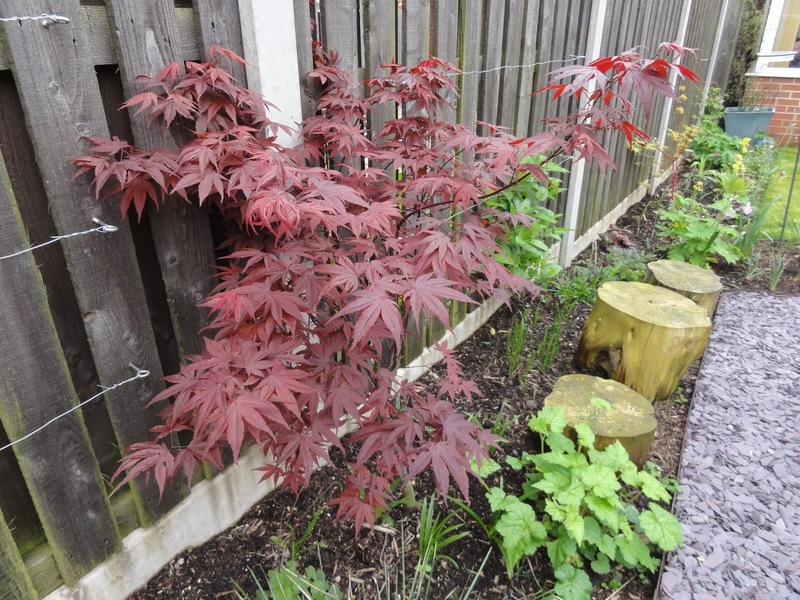 My visits to Stillingfleet Lodge Gardens and Harrogate Flower Show during April resulted is quite a few new purchases for the garden, mainly for the Shady Border. 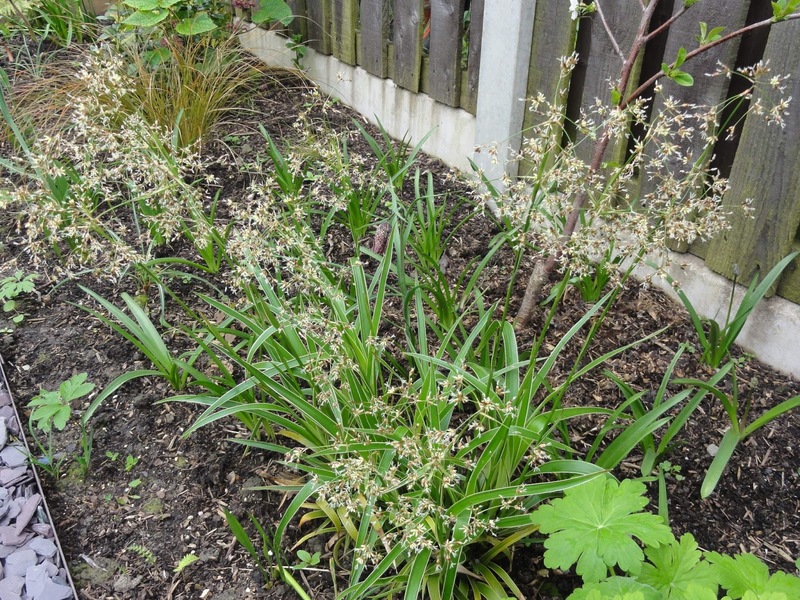 They include several Epimediums, a low growing Cornus canadensis for the Cornus Border, and Luzula sylvatica 'Taggart's Cream' to complement the other Luzula already in the Shady Border. These will be planted during May. 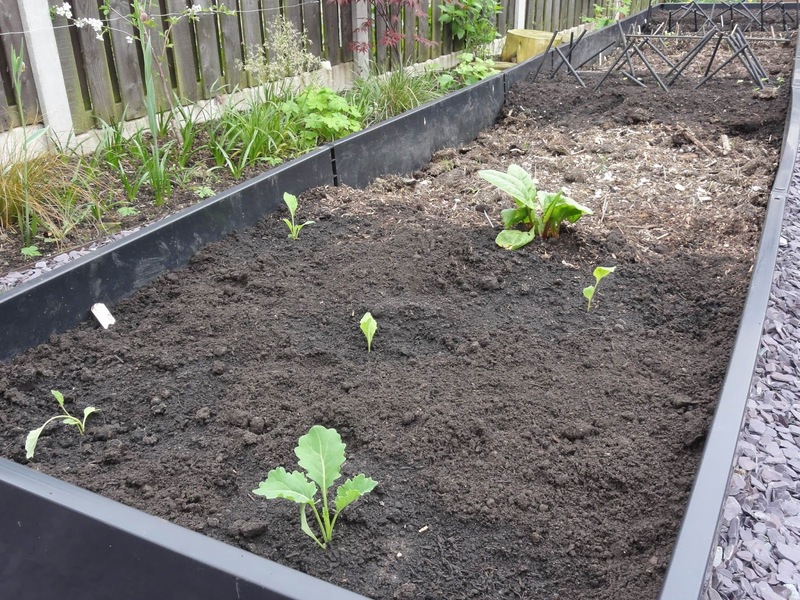 And if the lack of frosts continue, we might see the courgettes, pumpkins and Climbing French Beans also planted out and growing on by the end of May. See you then! End of month view is hosted by Helen Johnstone, aka @patientgardener. Visit Helen's blog for her April 2014 EOMV and links to other bloggers EOMV posts. You've made phenomenal progress in a month! You have forget-me-nots on the rampage, I have Lily of the Valley.. wish things I love would behave! Did the neighbours put the fence up in the wrong place? Love Cornus canadensis. I need to rescue mine from the onslaught of the Lily of the Valley, it never ends! Goodness you have achieved a lot Gwenfar, and so many new plants to cram in too! Its all looking smart, organised, and increasingly full of lovely looking plants. 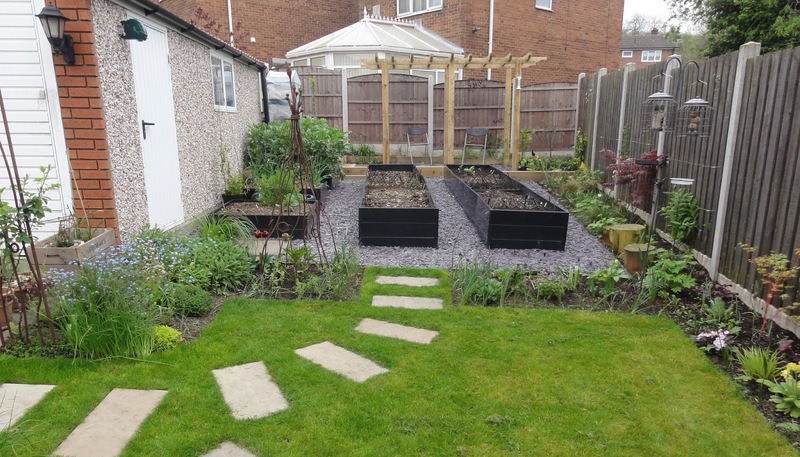 Your garden is so neat and tidy, you put me to shame! I see lots of lovely new plants, I think the planning where they are to go and the planting of them is one of the best times in a garden, Have fun! You've everything under control this month - everything is coming along nicely. It's good to read that your herb garden is now doing exactly what you want it to do. It's great when a plan all comes together isn't it? You bagged yourself some lovelies on your recent trips. I'll be looking forward to seeing how they grown.